Exploring My New “Home” Imperial Dam LTVA, Part Five: Katy Perry Live at the LTVA? Exploring My New “Home”, Imperial Dam LTVA, Part Three: Hey Handsome! Around the World… by Motorcycle! Harrison Brown – Alaska to Florida – BY BICYCLE! Photo Tip: HDR… What’s That About? Photo Tip: Make better photos by cheating on your spouse! Frogg Toggs: A broken promise of waterproof clothing? Is Your RV Warranty Worthless? Sorry Burt, it’s over between us! It’s 10 o’clock, do you know where your solar charge controller is? What did I get for my birthday? Lost! An early morning view along the Blue Ridge Parkway, NC. 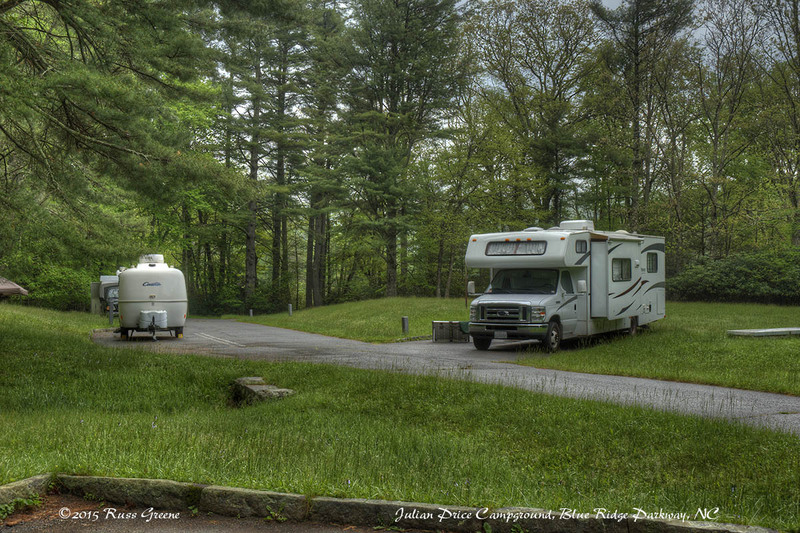 STAY LIMIT: I have campground information provided to me at three of the NPS BRP campgrounds. They each refer to rules for all of the NPS campgrounds on the BRP and they each have different information! Government… gotta love it. That said, I spoke to a ranger who said that two of the fliers I picked up are outdated and that the current rule for all the NPS BRP campgrounds is 30 days per season in any one campground. HOSTED: I did not notice a host in Loop A where I camped. GPS: N 36.13895, W 081.73536 This marks the turnoff from the Blue Ridge Parkway to the parking lot with the campground office. Kayaks can be rented at Julian Price Campground, as well as canoes. Hours vary between peak and shoulder seasons. ACCESS: Access to and within the campground is via paved roads. The roads within the campground are old and narrow. The campground map indicates 3 handicap accessible sites: two in loop A and one in loop C.
SITES: This campground has 129 tent sites (2 handicap sites) and 68 trailer sites, 6 comfort stations (1 handicap accessible). PULL THRU: I didn’t notice any in the loops I drove although there were some turnout style sites, albeit not very wide. MAXIMUM RIG SIZE: The Recreation.gov web site lists several pull-thrus in the 60-70′ range and I saw one, B38 listed at over 90′. I didn’t check them all. SPACING: on the close side for a government facility, I’d say. Part of Loop A is more exposed and that’s why I chose site A 32, so I could get some sun on my solar panel. 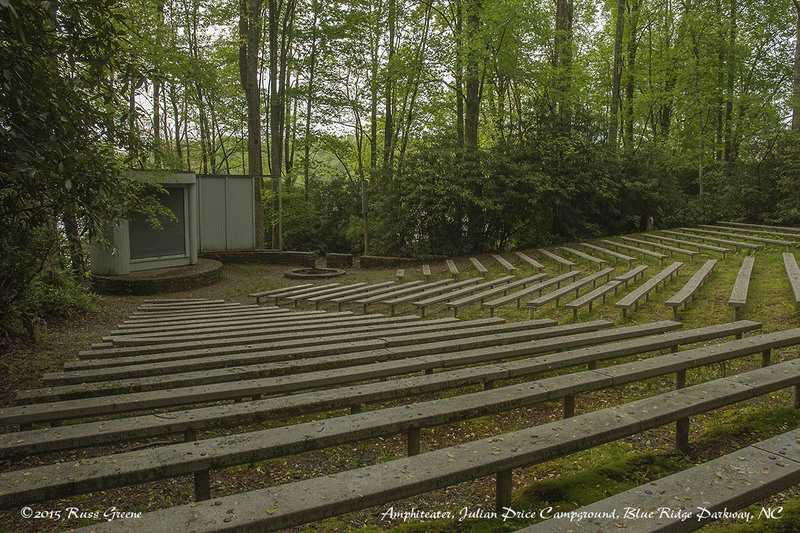 Loop A is the only one on the lake side of the Blue Ridge Parkway. It gets more road noise as a result. I got a No Service indication on my AT&T iPhone 5S without my Wilson Mobile 4G Booster. With the booster I had decent connectivity. With my Verizon iPad the booster improved performance significantly as well. RECYCLING: Plastic and aluminum, with the trash next to the dump station. 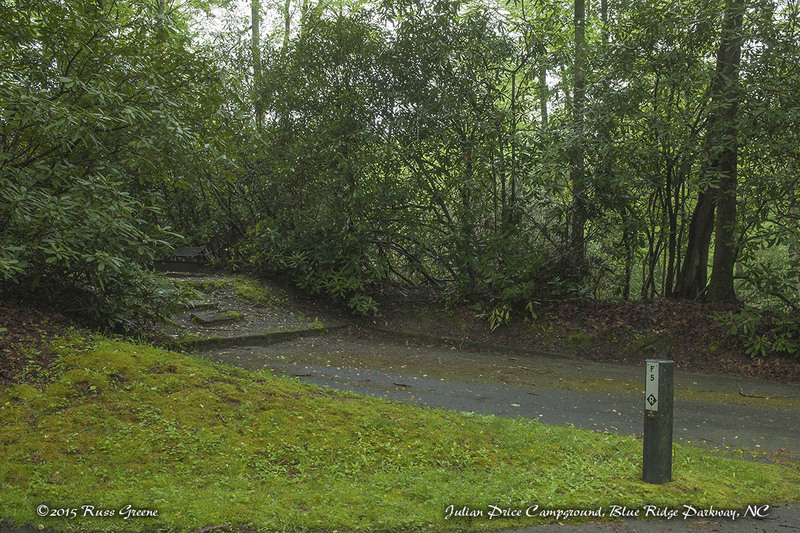 Julian Price Campground has pathways throughout it that lead to comfort stations, other loops and the amphitheater. 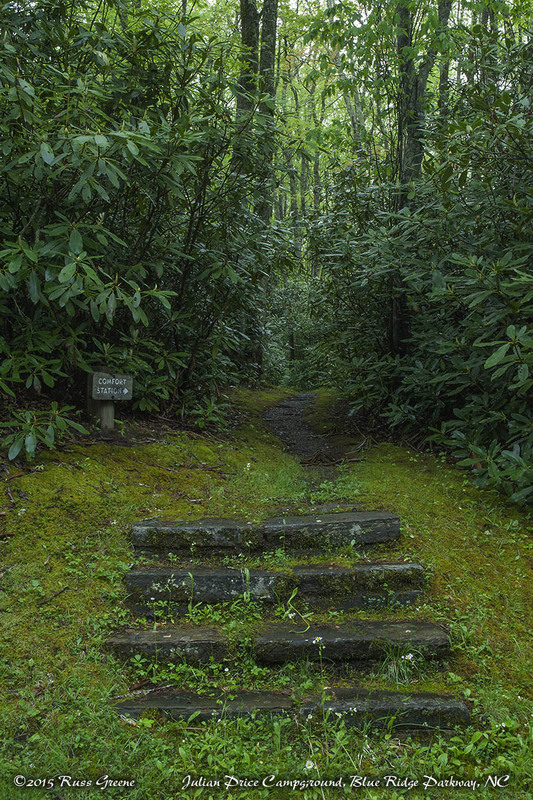 You could spend an hour or more wandering the pathways for a little fun exploration. Gas: GasBuddy indicates an Exxon Station in Blowing Rock, about 4.1 miles drive. Propane: AllStays indicates Blossman Propane in Vilas, about a 13 mile drive. Groceries: There’s a Food Lion in Blowing Rock: 7533 Valley Blvd. RV Parks: Grandfather Mountain Camp in Banner Elk, Honey Bear Campground in Boone, and Flintlock Campground in Boone are all pretty close. There’s also a Walmart Ask-to-Park in Boone. 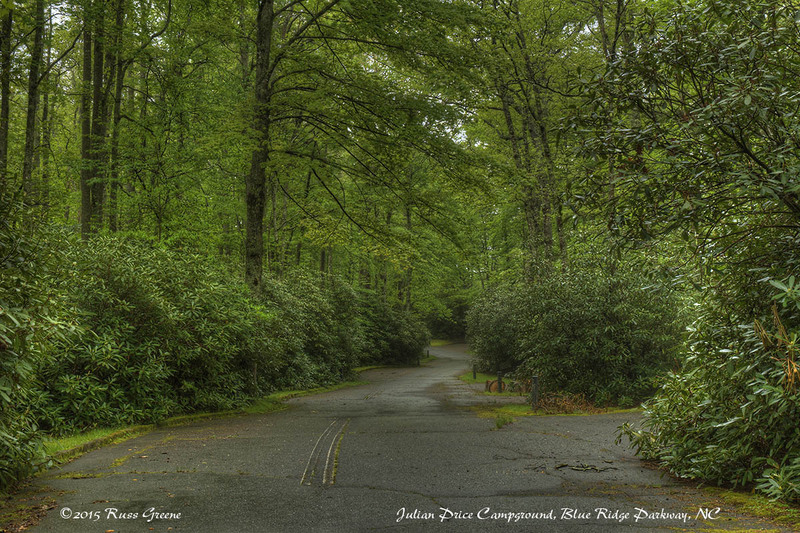 Julian Price campground is situated along the lovely Blue Ridge Parkway near the charming little town of Blowing Rock, NC. Now that’s an interesting name for a town and there’s a legend behind it which you can read here but that’s not how it got its name. Apparently, wind currents at a local precipice tend to blow in an upward direction so that objects, presumably lighter ones, tossed off the rock blow upward rather than falling down into the gorge below. Loops E and F look like this, at least at this time of year (May). Note the sites on the left are turnouts which scallop the road’s edge. Sites on the right are back-ins which are short but double wide. Some sites are reservable, others are not. See the campground map. Know as “America’s Favorite Drive” or something to that effect, the Blue Ridge Parkway is a 469 mile long National Park running along the crest of the Appalachian Mountains with its southern terminus at the Great Smoky Mountains National Park in North Carolina near the Tennessee border. Its northern terminus is at Shenandoah National Park in Virginia. From there you can pick up Skyline Drive and go for another 105 miles north through Shenandoah National Park. I picked up the BRP a little north of its southern terminus because in the southernmost section there are three tunnels my RV wouldn’t clear. I believe that is also the twistiest and windiest section which could be tricky and tiresome in a good size RV such as mine. This is a fairly typical site at Julian Price Campground–wooded, tilty, small. 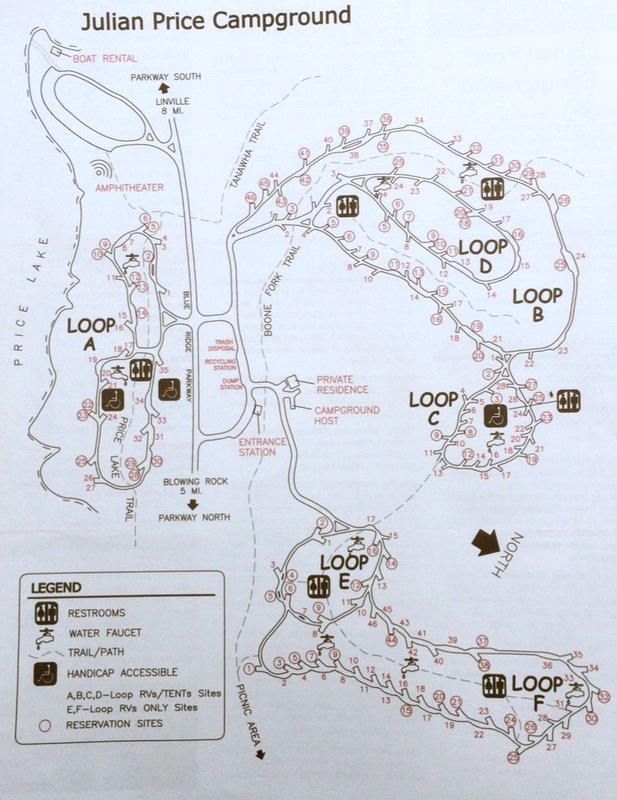 The campground has 6 loops, cleverly named A, B, C, D, E and F. Loop A were I camped is the one loop on the lake side of the BRP. I couldn’t see the lake from my campsite, #32, but I could both see and hear traffic as it passed by on the BRP about 100′ from my site. The BRP doesn’t get much traffic at this time of year, or so it would seem from my experience. While working on this report at about 8 AM it was several minutes between cars passing. I drove through loops E and F before driving over to loop A where I settled into space 32 because, a) I could fit (barely), b) it wasn’t horribly tilty (is too a word!) and c) I could get some sun on my solar panel, that is if it would only stop raining! It’s very woodsy here. I’m not sure you’ll ever see the sun over in loops E and F. Tose loops seemed quite closed in with small, close campsites, a narrow road and lots of rhododendrons crowding around. If I get around to exploring loops B and D I’ll update this report. The more westerly part of Loop A was enveloped by rhododendrons, not yet in flower as of May 18. I could see buds preparing to open, so maybe by June. It was warm and muggy during the first day of my visit. It drizzled on and off. The second day I awoke to overcast skies and drizzle; somewhat cooler too. At 3200′ in elevation I’m sure it is cooler here than at lower climes in the surrounding areas. The southeast US, I’m told, is a hot and muggy place to be in the summertime. Glad I’ll be gone further north by then. At the westerly end of Loop A is the campground amphitheater. It can seat well over 200, maybe more than 300. Somewhere I saw a schedule of programs but they seemed infrequent, maybe just weekends, at least this time of year. If you enjoy such things it might be worth inquiring at the office or via phone. 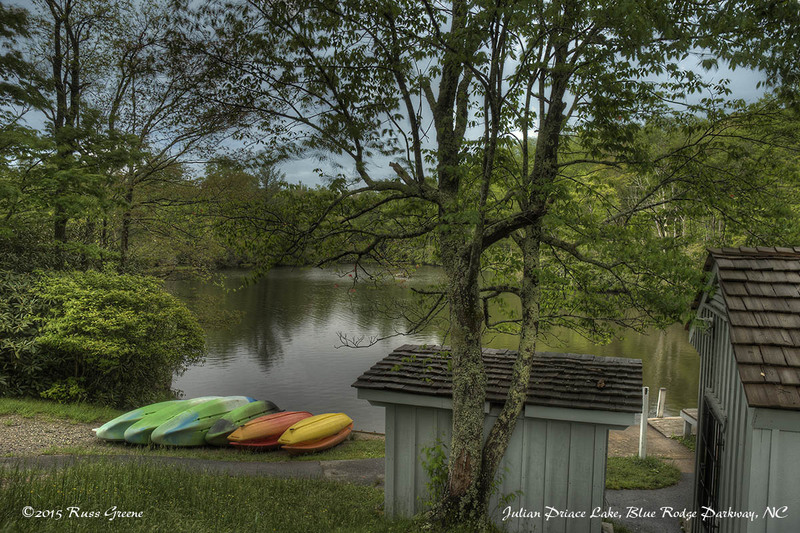 Next to the amphitheater is a shack where kayaks and canoes can be rented for floating around on the lake. It’s only open weekends (Friday-Sunday) from April through Memorial Day, then daily through Labor Day and then back to the 3 day schedule through October. That schedule would seem to indicate the high season as well as the shoulders for the BRP, at least around here. People fish at the lake and I believe it is stocked. This blog takes an enormous amount of time and energy to build and maintain . If you have found something useful or entertaining please Favorite (bookmark) this Amazon.com link and use it when you shop at Amazon. Doing so will cost you no more and in some cases I may receive a small commission. Your support in the form of using my Amazon.com link or making a PayPal Donation will be greatly appreciated. Thank you. 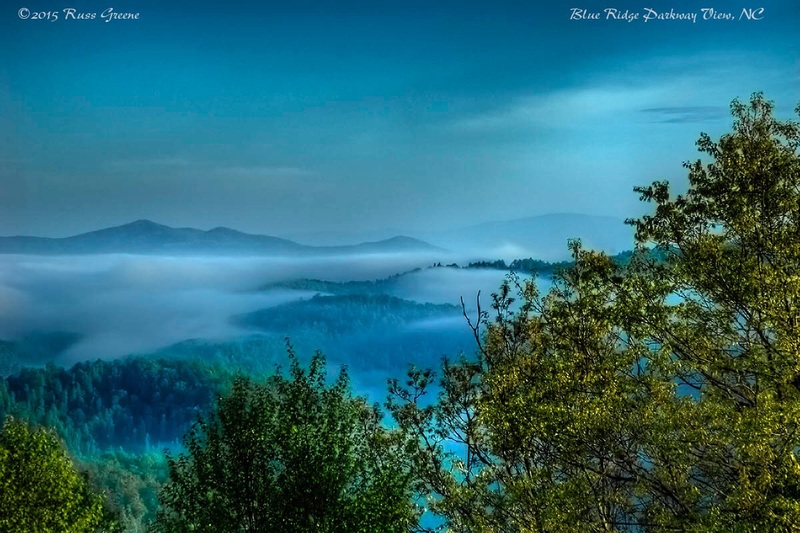 I really liked the Blue Ridge Mountain shot, beautifully captured. Also the kayak shot makes me want to be there. Yes, It’s very lush here and I love that. Maybe we’ll have a chance to meet up again. After my trip up the east coast I need to get to MI, KY, KS, OH, NE, IL and Indiana (What’s the abbreviation for Indiana? I don’t know all them all!) in order to complete all 50 states. It might be about August or so I make it out that way. First week of September we’ll be in St. Ignace MI visiting Mackinac Island. Then we meander back toward SD, CO, NM and AZ…. loosely planned. Consider visiting Sleeping Bear Sand Dunes and Mackinac Island. A couple of my MI favs. I wish I felt as if I had more time to explore the trail… who knows, maybe I’ll decide to take a few days just to do so. Thx for your great blog concerning Julian Price NP. We go the the area every summer in late June for the Blood, Sweat and Gears bike race/ride and have tent camped there several times right on the lake. Being from Florida, we find the weather quite refreshing at that time of the year. Highs around 80 but more importantly, dew points in the low 60’s. Blood, Sweat and Gears… clever name… I like it. The Blue Ridge Parkway is a unique and lovely park. Natchez Trace is similar in that it’s a park over 400 miles long built along a roadway. I wonder if they have any bike races there.